Decrease in Numbers of Naive and Resting B Cells in HIV-Infected Kenyan Adults Leads to a Proportional Increase in Total and Plasmodium falciparum-Specific Atypical Memory B Cells. Frosch AE, Odumade OA, Taylor JJ, Ireland K, Ayodo G, Ondigo B, Narum DL, Vulule J, John CC. Journal of immunology (Baltimore, Md. : 1950). 2017; 198(12):4629-4638. Efficient generation of monoclonal antibodies against peptide in the context of MHCII using magnetic enrichment. Spanier JA, Frederick DR, Taylor JJ, Heffernan JR, Kotov DI, Martinov T, Osum KC, Ruggiero JL, Rust BJ, Landry SJ, Jenkins MK, McLachlan JB, Fife BT. General Approach for Tetramer-Based Identification of Autoantigen-Reactive B Cells: Characterization of La- and snRNP-Reactive B Cells in Autoimmune BXD2 Mice. Hamilton JA, Li J, Wu Q, Yang P, Luo B, Li H, Bradley JE, Taylor JJ, Randall TD, Mountz JD, Hsu HC. IL-4-secreting secondary T follicular helper (Tfh) cells arise from memory T cells, not persisting Tfh cells, through a B cell-dependent mechanism. Fairfax KC, Everts B, Amiel E, Smith AM, Schramm G, Haas H, Randolph GJ, Taylor JJ, Pearce EJ. The transcription factor KLF2 restrains CD4⁺ T follicular helper cell differentiation. Lee JY, Skon CN, Lee YJ, Oh S, Taylor JJ, Malhotra D, Jenkins MK, Rosenfeld MG, Hogquist KA, Jameson SC. Humoral immunity. Apoptosis and antigen affinity limit effector cell differentiation of a single naïve B cell. Taylor JJ, Pape KA, Steach HR, Jenkins MK. Direct visualization of endogenous Salmonella-specific B cells reveals a marked delay in clonal expansion and germinal center development. Nanton MR, Lee SJ, Atif SM, Nuccio SP, Taylor JJ, Bäumler AJ, Way SS, McSorley SJ. Hapten-specific naïve B cells are biomarkers of vaccine efficacy against drugs of abuse. Taylor JJ, Laudenbach M, Tucker AM, Jenkins MK, Pravetoni M.
Intravascular staining for discrimination of vascular and tissue leukocytes. Anderson KG, Mayer-Barber K, Sung H, Beura L, James BR, Taylor JJ, Qunaj L, Griffith TS, Vezys V, Barber DL, Masopust D.
Macrophage scavenger receptor 1 (Msr1, SR-A) influences B cell autoimmunity by regulating soluble autoantigen concentration. Haasken S, Auger JL, Taylor JJ, Hobday PM, Goudy BD, Titcombe PJ, Mueller DL, Binstadt BA. Most vaccines provide protection by inducing the production of antibodies that can bind to a pathogen and block infection. Unfortunately, there are many dangerous viruses in which the development of a vaccine has been elusive despite decades of intense research. These failures highlight gaps in knowledge about the type of cell that can produce antibodies, the B cell. 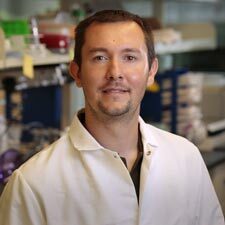 The Taylor lab aims to inform vaccine design by gaining a deeper understanding about the mechanisms limiting the generation of a protective B cell response.